…and then we held hands is a non-verbal, cooperative game about balancing relationships. Without speaking, the two players must strategically play cards to meet the emotional objectives of the players, each from their own perspective. …and then we held hands was designed by David Chircop and Yannick Massa as part of Global Game Jam in 2014 where it won both Best Board Game and People’s Choice Awards. A double-sided board defines the steps of emotional balance. 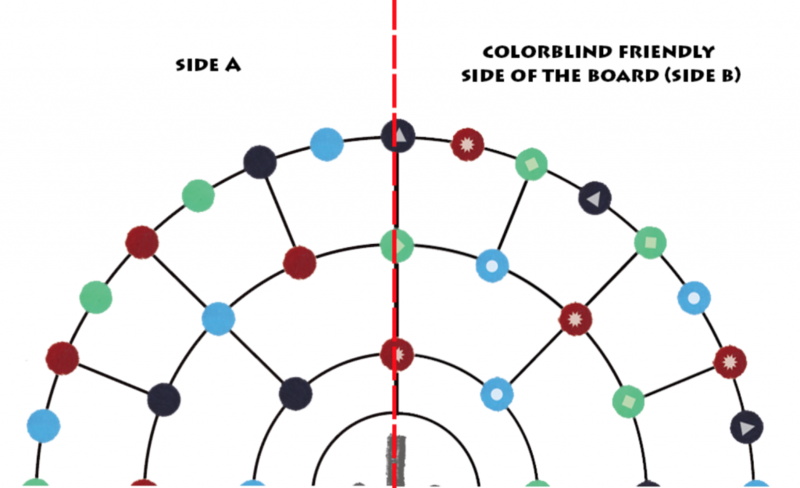 One side of the board contains full circles while the other side of the board contains circles with symbols, making it friendly for colorblind players. The nodes illustrate the emotions in the player’s emotional journey. Part of the front and back sides of the board. There are emotional objective cards that tell the players which node they must end on to successfully fill that need. It’s not as easy as simply moving to that node. 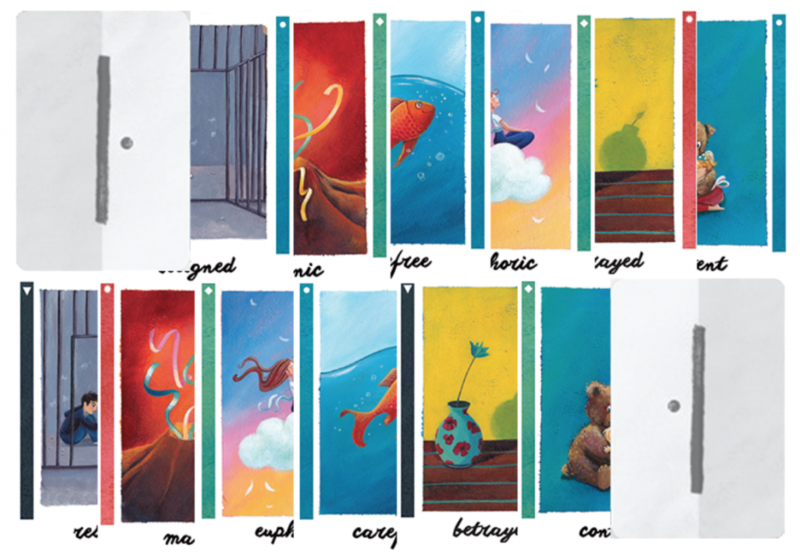 In front of each player are a string of six emotion cards with half the card showing, which they will use to meet the objective. Sometimes the left and right side of the cards will have matching emotions (black, red, blue, or green), and sometimes they don’t. Players can use as many of these cards as they would like to meet the objective. In fact, they can use any number of their partner’s cards to move. Of course, they’re not allowed to communicate at all about whether or not their partner should take their card or not, so playing your partner’s cards may ruin their ability to play their turn. Players cannot move over the same node more than once in the same turn, and they cannot move through their partner’s token. Also, on the board in front of each player is a balance scale. The balance scales determines how many cards a player can play when trying to move. When playing a card that matches a color on one side of the scale, the marker is moved toward that side. If the marker is ever on a -2 or +2 spot, no more cards from the side can be played. Once a player is finished moving, they may only draw new cards (up to the limit of 6) if they end with their marker on 0, indicating that their emotions are balanced. As players move from the left to the right side of the board, their perspective on the relationship changes. This obviously affects their emotional state and allows them to use the left or right side of their emotion cards based on the location of their player token. The game either ends with both players being balanced and centered, or they lose along the way. Winning requires both players to enter be on 0 on the balance scale as well as enter the inner ring on consecutive turns. Losing can happen in a number of ways: if players are unable to end the game as just described; if, on the beginning of their turn, a player is unable to make a valid move; or, if the demotion card deck is depleted and there are no emotion cards in front of the players. The first, most noticeable difference is the art in the game, which has been drawn by Marie Cardouat. There is now less of a focus on finding love in a relationship and more on finding emotional balance. Variants have also been added, requiring both players to complete a given objective before it can be completed. …and then we held hands is now Kickstarter. To stay up-to-date on this and other LudiCreations games, sign up for the newsletter.